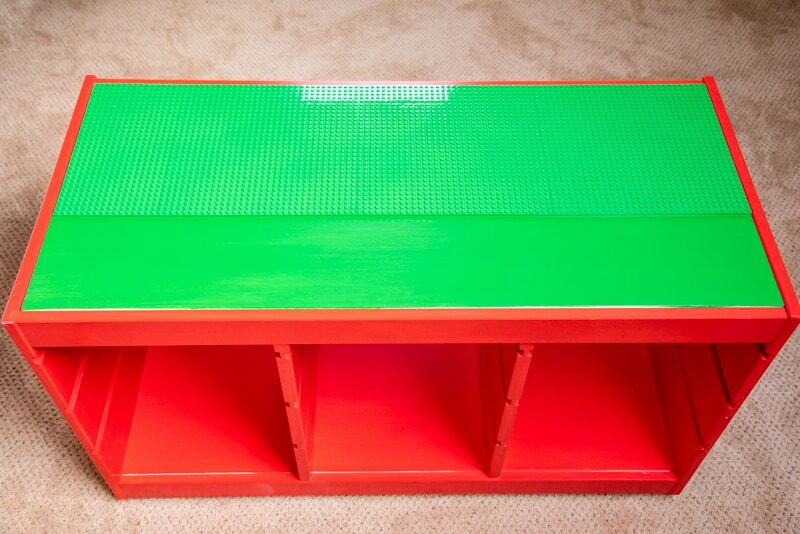 This IKEA Lego table hack will be a huge hit with your little Lego fan! 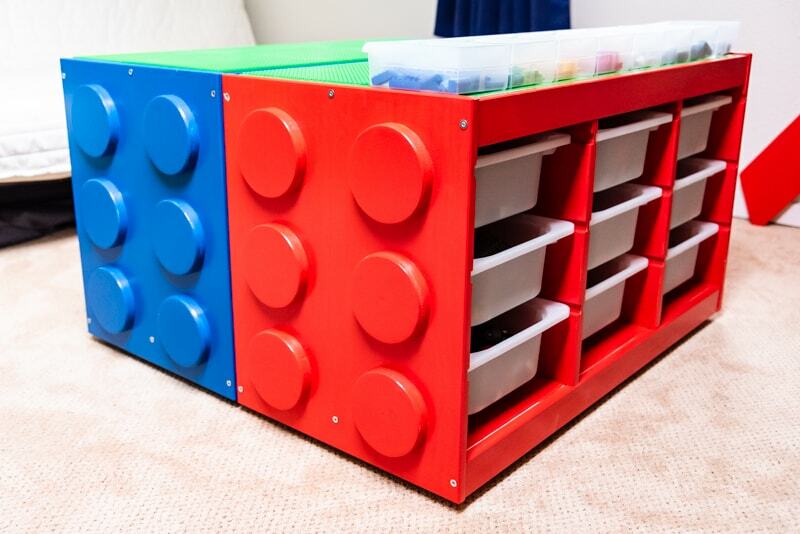 Turn that boring IKEA Trofast into a jumbo size Lego brick with loads of storage! My son has a ridiculous amount of Lego in his playroom, and the DIY Lego table I made for him a year ago wasn’t cutting it anymore! 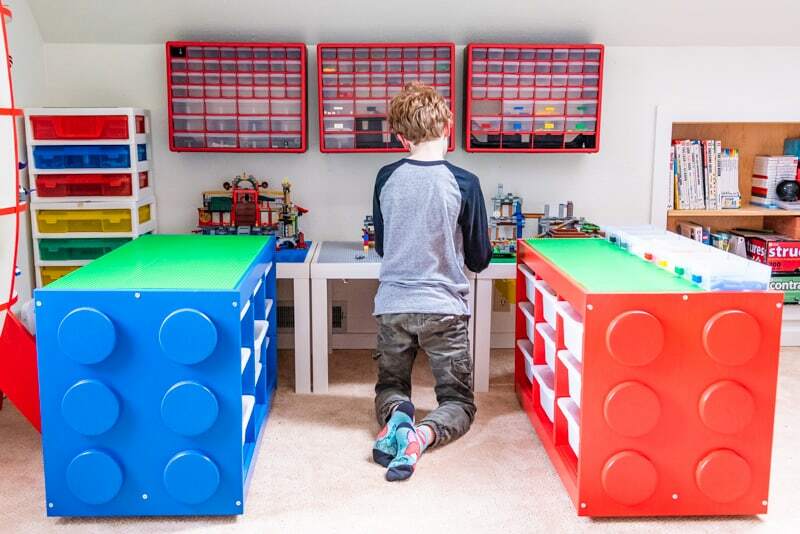 His new IKEA Lego table made with Trofast drawer units has 18(!!!) shallow bins inside, plus more on top for sorting. Best of all, it looks like two jumbo Lego bricks! I’m always looking for Lego storage ideas to corral all these plastic bricks that seem to multiply in our house. You’d think that after making him the first Lego table, a minifigure display and a travel Lego bin, we’d have them under control by now! But then his birthday and Christmas came, and we were flooded with pieces again! Ready to make your own? Here’s what you’ll need! I prefer the solid pine version because it’s sturdier than the particleboard version. 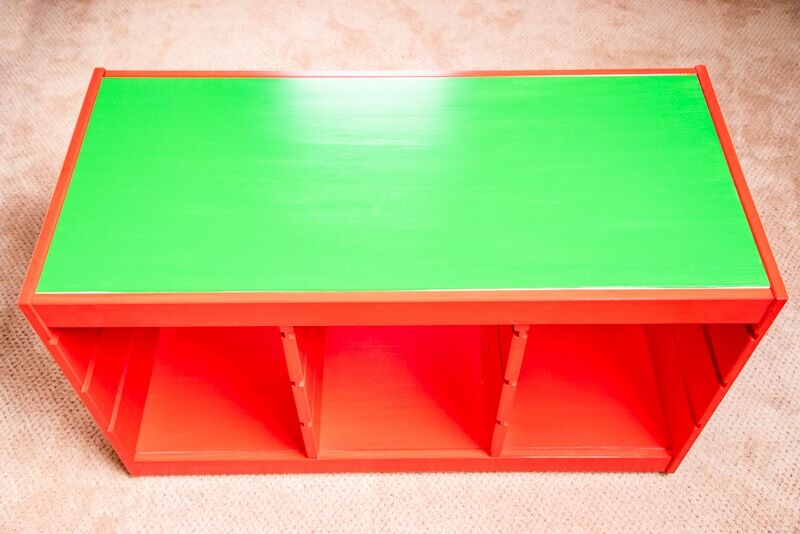 I used Glidden’s Red Geranium, Behr Marquee’s Mondrian Blue and Behr’s Park Picnic for the red, blue and green. 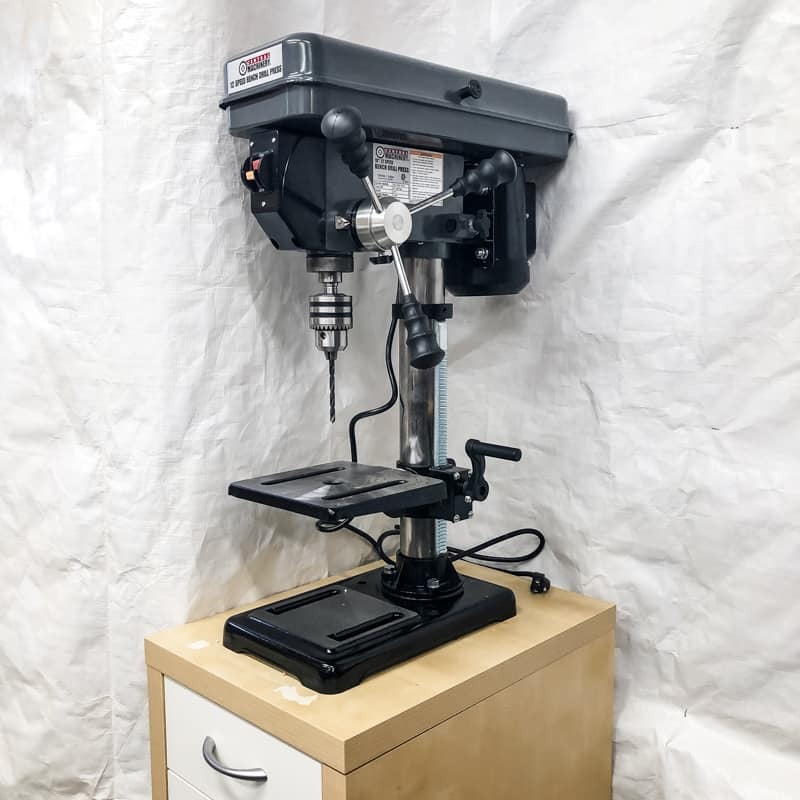 If you follow me over on Instagram, you might have seen the newest addition to my workshop: a drill press! It was always one of those tools that would be nice to have, but I never had enough space. But after moving some junk out from behind the “white tarp of doom and mystery” I managed to squeeze one in! I dug out all the 1 x 6 end cuts from the scrap wood bin for this project. 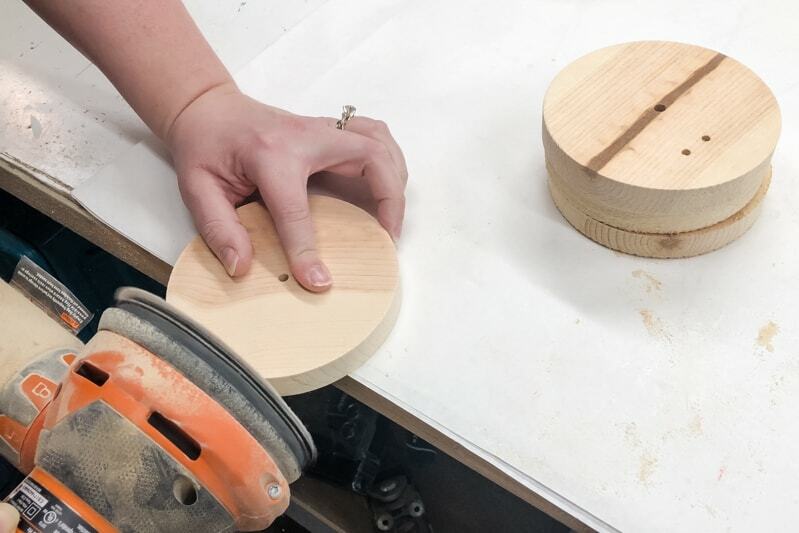 After loading a 5″ hole saw into the drill press, I quickly cut out a dozen perfect circles. 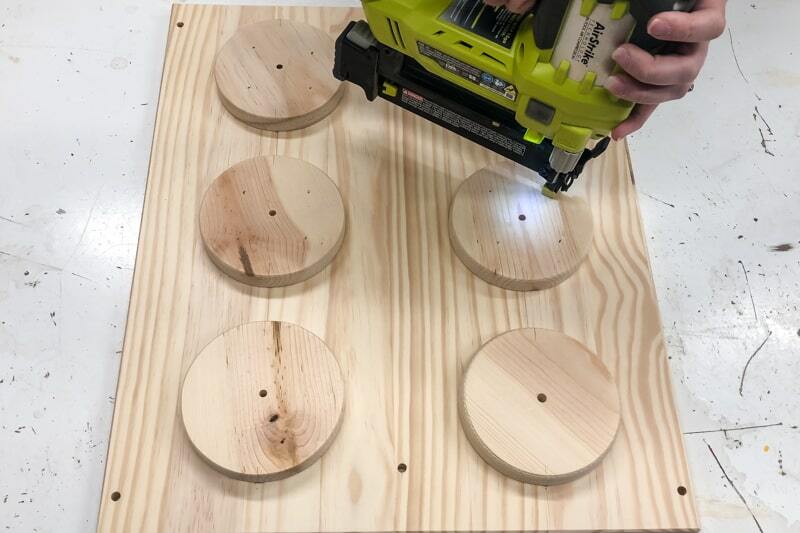 You could also do this with a regular handheld drill, or buy premade 5″ circles. 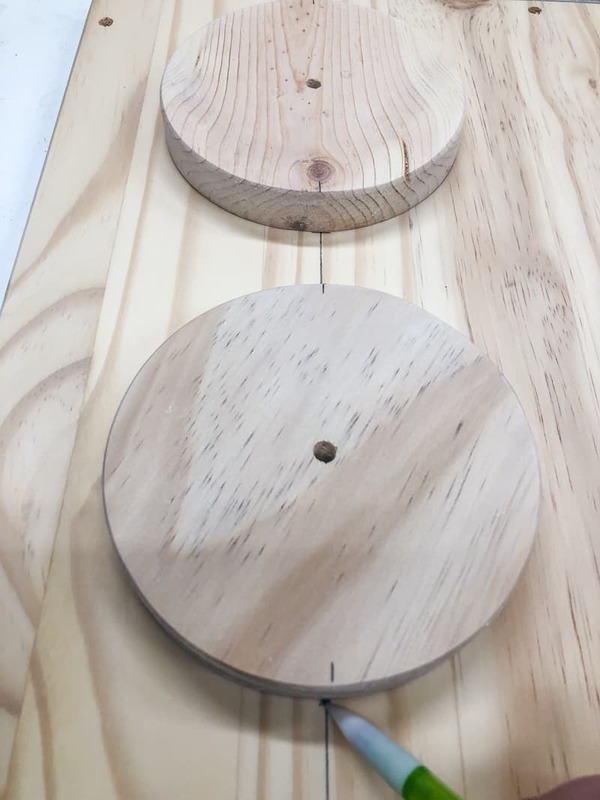 I still don’t have a bench sander (yet! 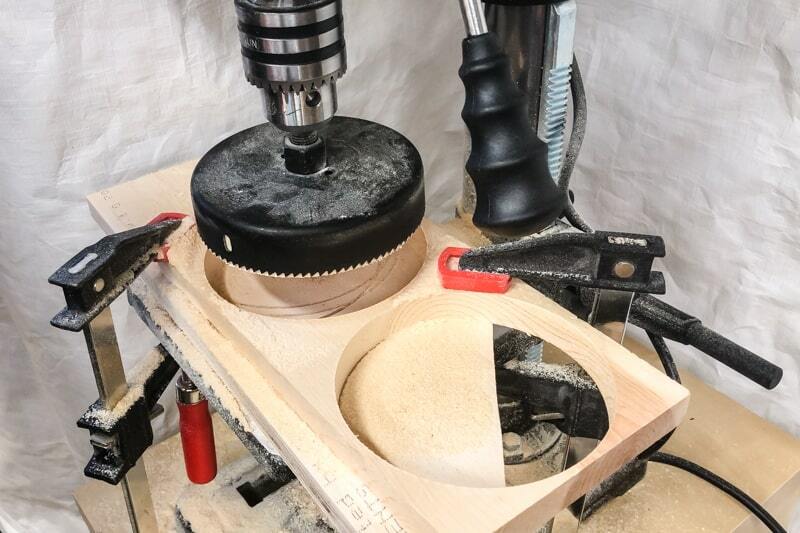 ), so I held the random orbital sander vertically to sand the cut edges of each circle. Then I tilted it at an angle to round over the edges. 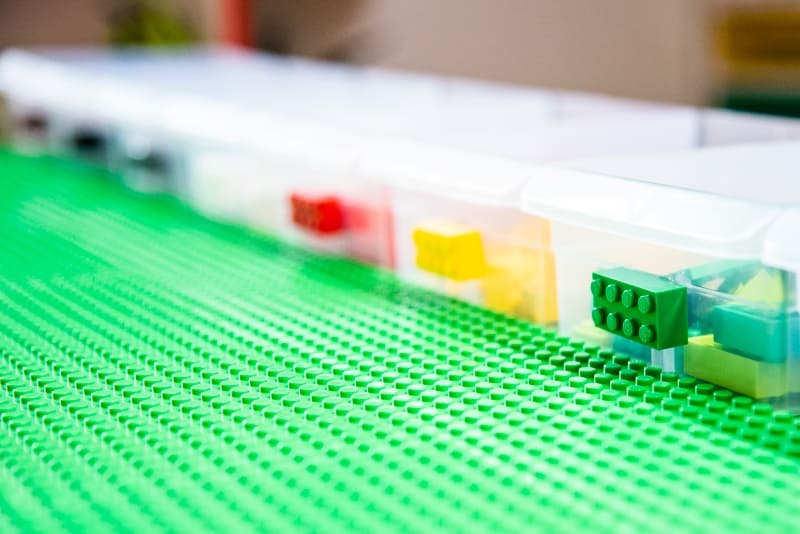 Getting the right spacing is key to making these side panels look like Lego bricks! 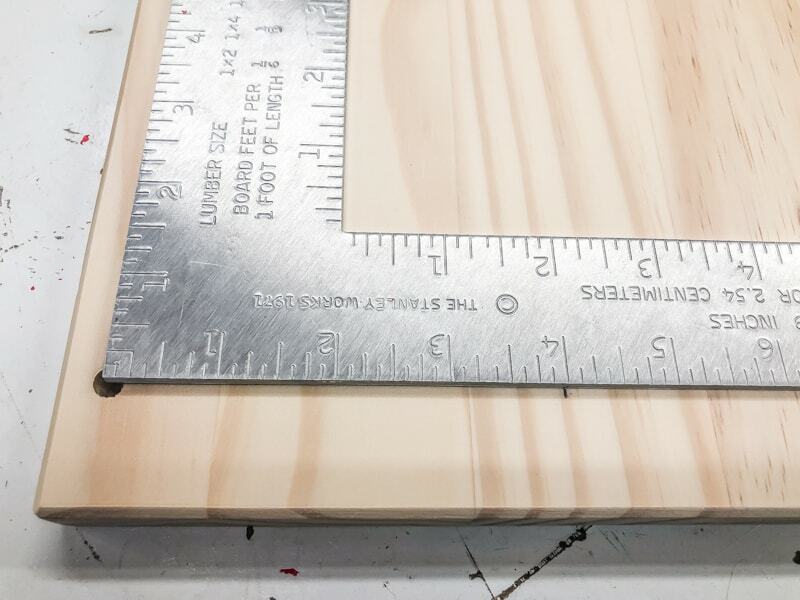 I drew a line 4″ in from the screw holes on the sides of the panels first. Then I marked a straight line across the middle of each circle. 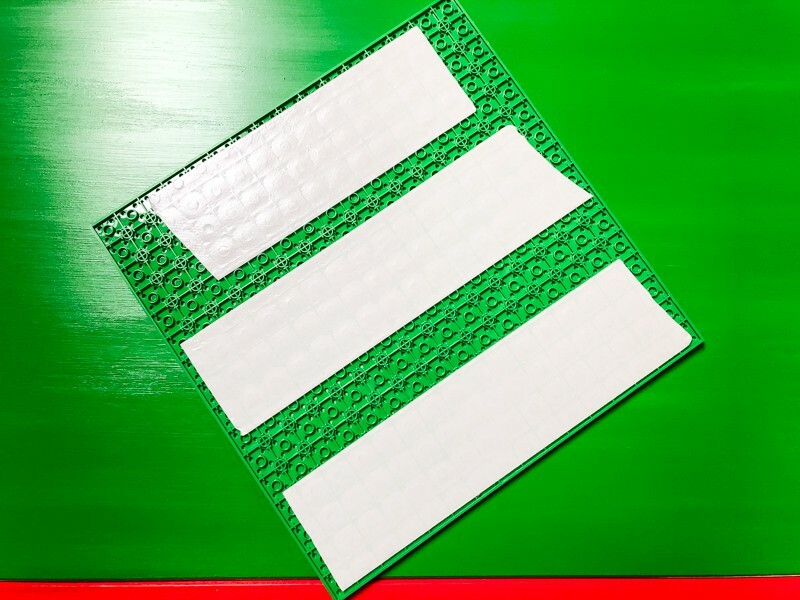 Align the marks on the circle with the line on the panel, spacing the dots 1 1/2″ apart. 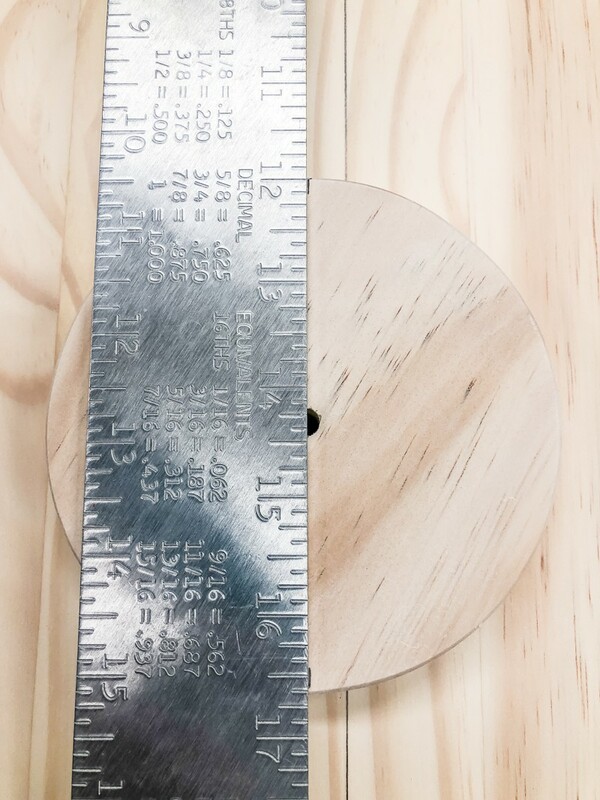 I found it easier to mark the edge of the circle first, then remove it and measure 1 1/2″ down. 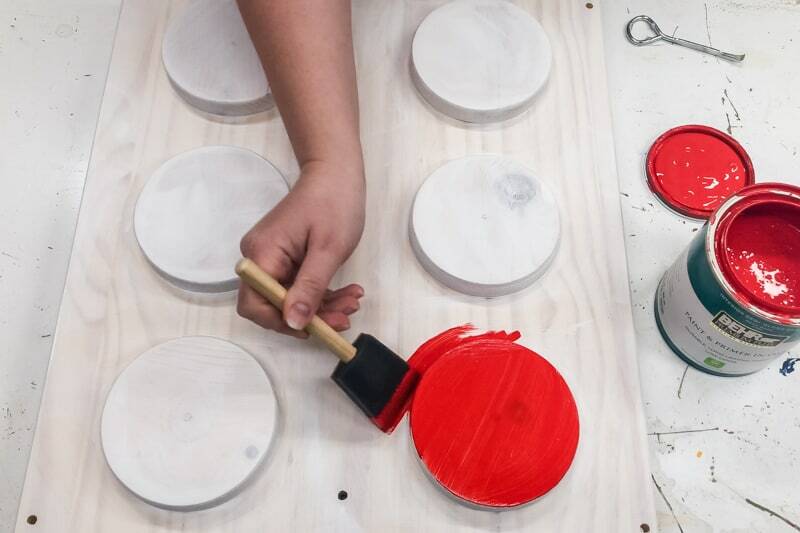 Once all the dots are in place, attach them with wood glue and 1″ brad nails. 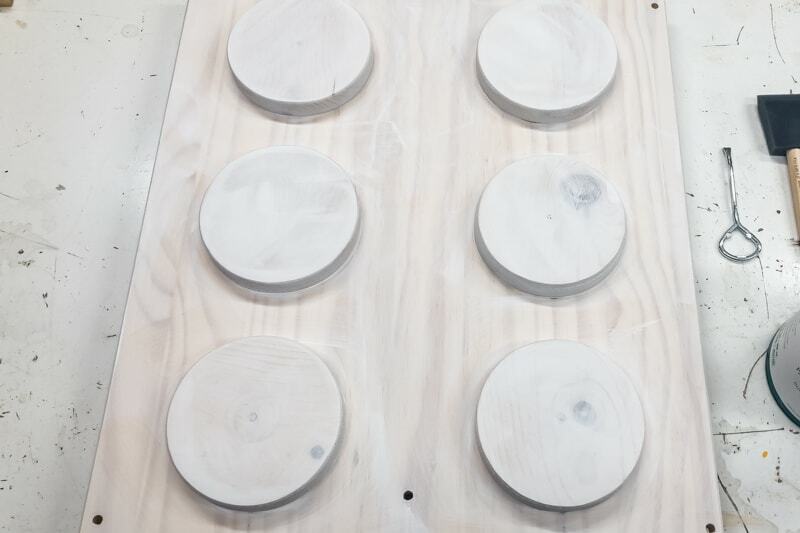 Fill the holes with wood filler and sand smooth when dry. Trust me, do NOT paint these IKEA Trofast pieces without a bonding primer! 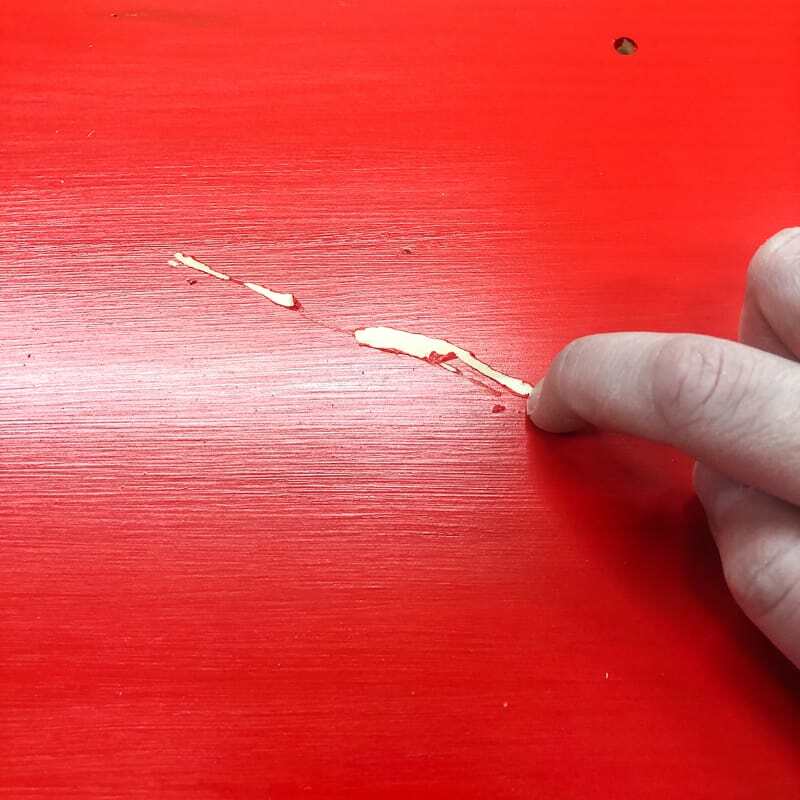 Even though they look unfinished, they have a clear coat of sealant that prevents paint from sticking to it. I got halfway through painting mine without primer when I discovered that the paint just peeled right off! Ugh! 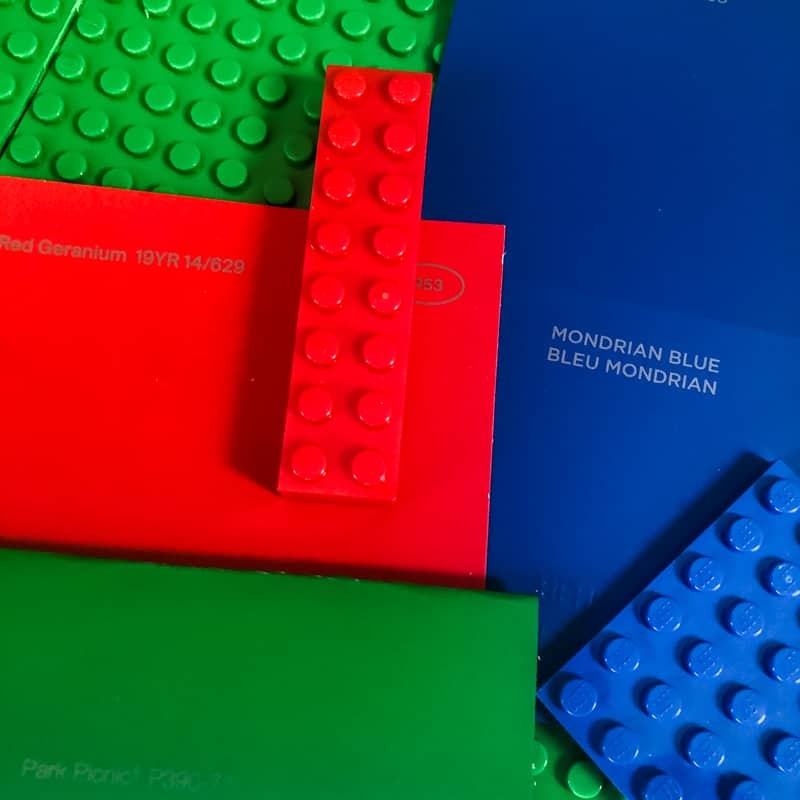 I brought red, blue and green Lego pieces with me to the store to find the perfect color match. It turns out that Glidden’s Red Geranium, Behr Marquee’s Mondrian Blue and Behr’s Park Picnic are spot on! Deep colors like this need multiple coats to get good coverage. Three coats later, my IKEA Lego table was ready to be assembled! Putting together the IKEA Trofast frames is pretty easy, although the paint made it a little harder to fit the side rails into the grooves. Nothing a hammer won’t fix! 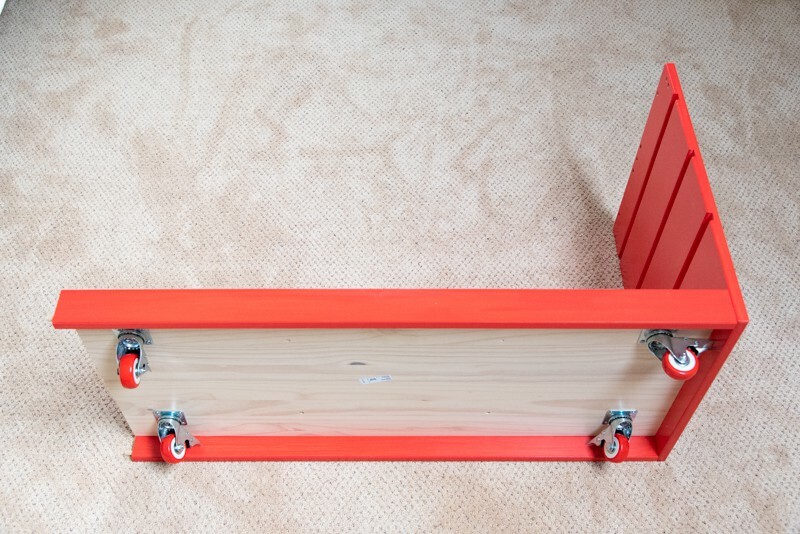 After assembly, flip the frame over and attach 3″ casters to the bottom. Make sure they can swivel freely in each corner. I attached them to the red side before I assembled the frame, and the wheels were stuck in the corners! Oops! Official Lego baseplates cost a fortune, so I used these off-brand ones that are a fraction of the price. Three packs would have been enough to cover both tops, if I hadn’t messed up one of the cuts! 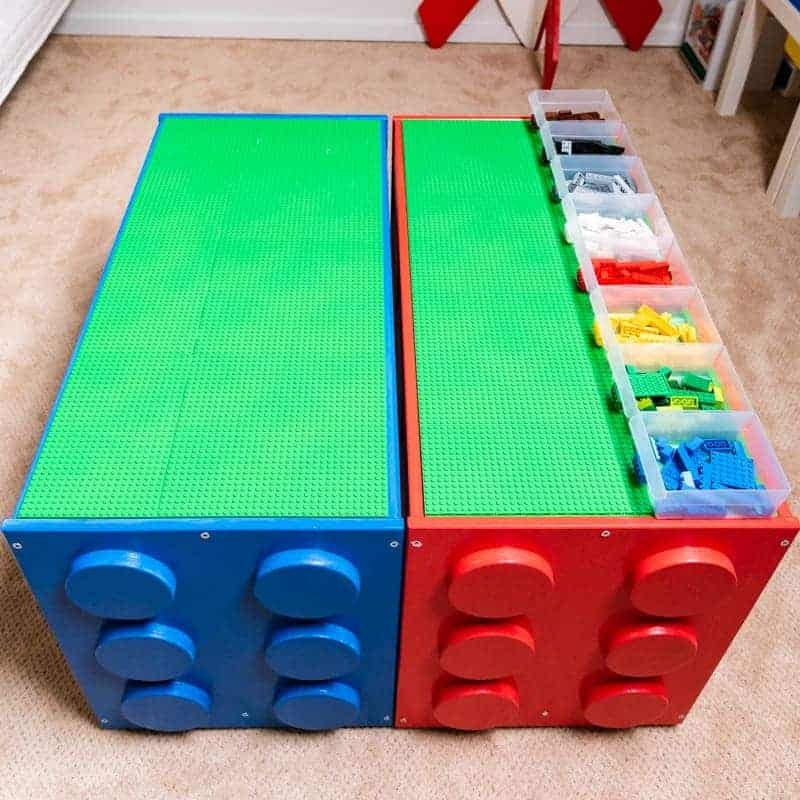 Luckily, the wall storage bins over the other Lego table fit almost perfectly in the empty space! My son doesn’t sort the pieces as much as I hoped he would (wishful thinking! ), so hopefully this will be a better use for them. I decided to use double sided carpet tape to attach the baseplates to the tops. It’s super thin and super sticky, and it seems to hold better than the glue I used previously. 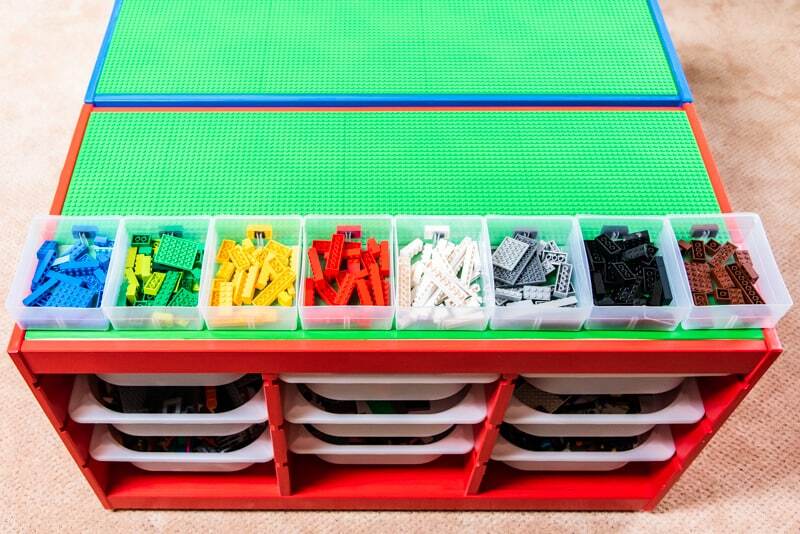 Fill Up the IKEA Lego Table Bins and Start Building! It’s amazing how many Lego pieces you can fit into 18 of these bins! I’m hoping this setup will be enough storage to last him many years! When my son rushed upstairs to check out his new Lego table after school, his face was priceless! He couldn’t wait to get in there and start building. 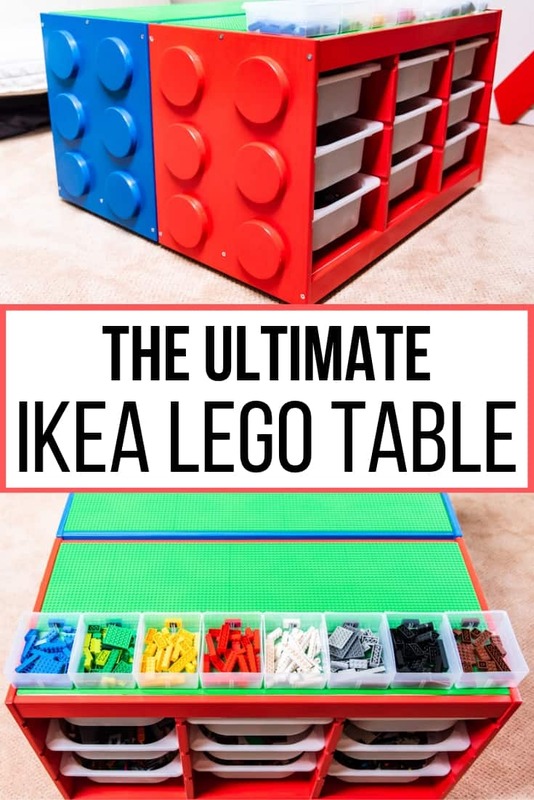 I showed him how he could move the tables around the room, and he decided he liked a U-shaped setup that incorporates the old IKEA Lego table with the new one. Now he has every single Lego piece at his fingertips! Now the playroom truly is the ultimate Lego building room! 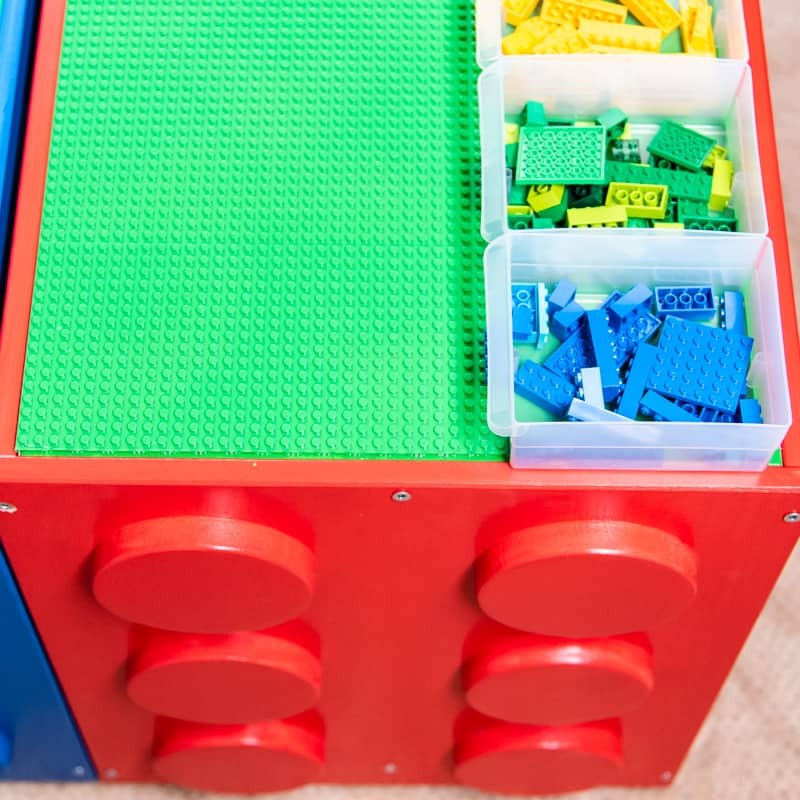 Want More Lego Storage Ideas? Try these! The white Lego tables you see in the background are also made from IKEA pieces. Find out how to make that one here! 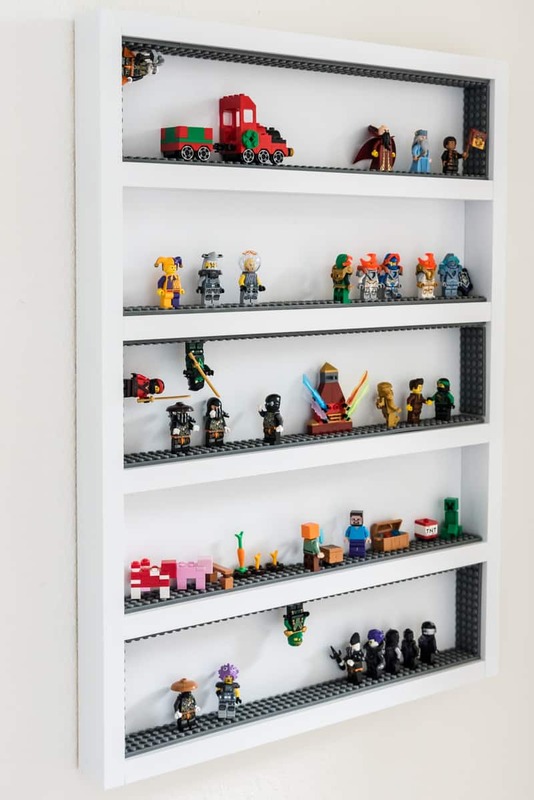 Keep all your favorite characters in one spot with this DIY Lego minifigure display case! 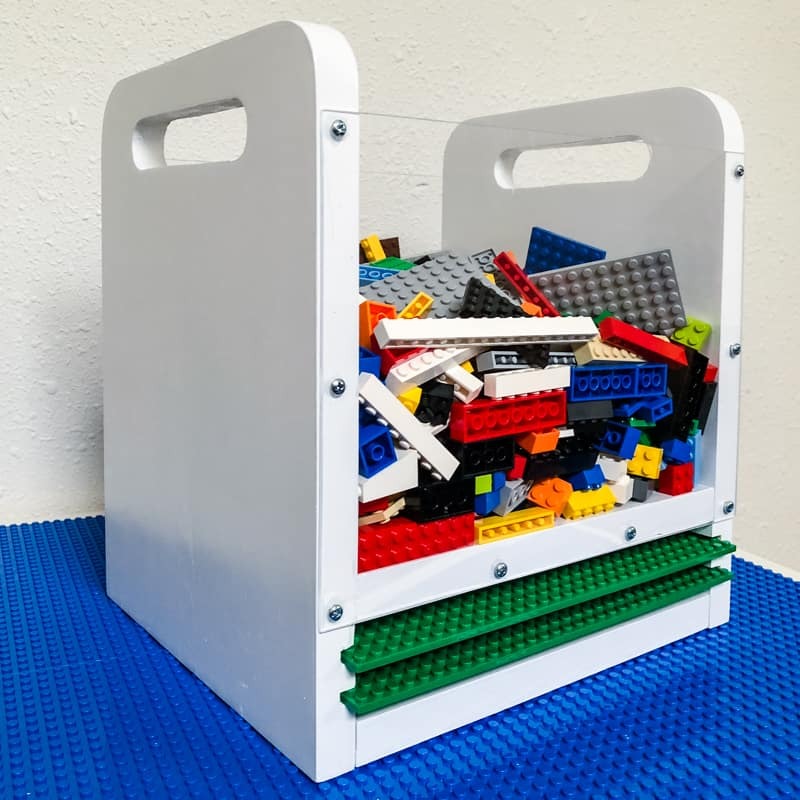 Take the building fun on the go with this travel Lego bin! 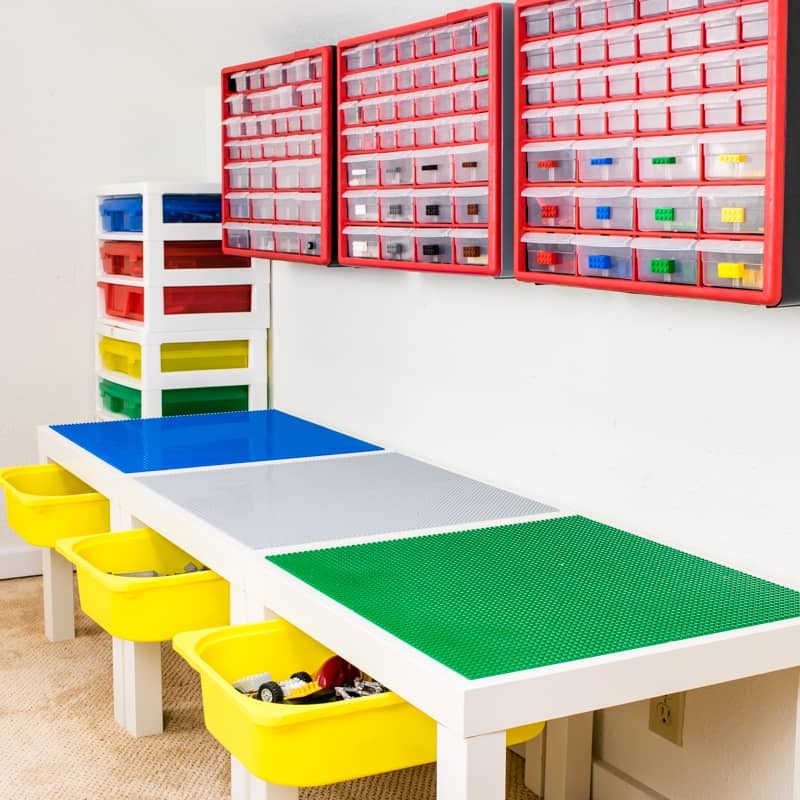 Find even more Lego storage ideas here! This is so cool. My girls are obsessed with Legos and they are slowly taking over my home!! ARG!! I love everything about your set up and it has given me some great ideas. Thank you. Thanks Jamie! I’m glad it was helpful. We’re always battling with the Legos, but hopefully this will keep them in one spot!